Our summer camp for primary students features a welcoming environment full of learning and fun. Each week we explore a different theme while filling our days with games, singing and dancing, outdoor adventures, and other enjoyable activities. Weekly tuition is $345. Add-ons such as extended care and lunch are available for an additional cost. More About Our Weekly Camp Themes NEEDS UPDATING!! Children will exercise their gross and fine motor skills while enjoying a variety of sports and games designed to build concentration, strength, speed, and skill. Young chefs will prepare, cook, serve, and devour deliciously fun foods while learning about healthy choices. Celebrations abound with visits to various holidays and a look at why and how we honor them. Campers will dive into natural science and discover what lives in our land, air, and sea. Children will explore how letters and numbers are a part of our daily environment. They will discover unique ways to create and use letters and numbers. Children love to go, go, go! We’ll explore some of the many ways to get from here to there. We begin music camp by exploring music’s many uses, and then we discover how anything can be an instrument! Children will experience conventional and unconventional instruments. Grab your suits and towels! Children will enjoy various activities involving water. Specific activities may depend on weather. How did you do that? Our young scientists will discover how while performing hands-on experiments. Children have ample opportunities to be active this summer either in our outdoor playground or on the Gerstung equipment and Imagination Playground located in our gym. We offer “water play day” every Friday, which includes time for the children to play with water toys outside and run in the sprinkler. 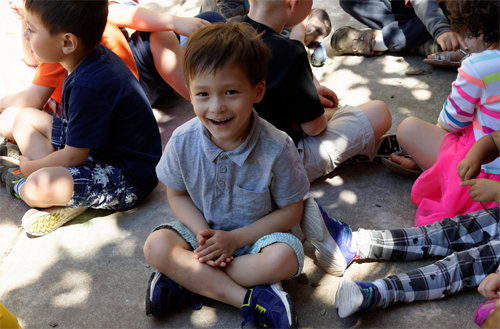 On temperate days, the class will spend additional time outdoors such as by doing daily lessons, eating lunch and snack, gardening in the greenhouse, and taking neighborhood walks. Children entering kindergarten may join the primary camp or may be eligible for some of our elementary camps. Sign up for as many or as few camp weeks as you like. Primary campers must be fully toilet-trained (wearing underwear) and dressed in clothing that promotes independence, such as bottoms with elastic waistbands and shoes with velcro fasteners.